Last night a liver saved my life. OK, not literally. But a liver dish was served to me that confirmed yet again why I love this not-so-humble organ. Also in this dish, which was a work of fine genius: Sweet, plump, juicy cherries popped softly in the mouth, contrasting with salty, chewy, tiny bacon tiles and those hefty, hepatic pieces de resistance: firm yet soft, unspeakably intense duck livers. These babies don't look like dried blood by accident. During my twenty years as a strict vegetarian, I never missed most meats. Chicken, fish, anything with fat or skin or bones -- goodbye forever, please. But I often craved organs. Yeah, the internal kind. External organs, as I learned while being forced to eat beef tongue as a child and more recently while researching an article about penile and testicular cuisine, seem to me inedible, as wrong to consume as hair. But the internal organs, those hard-working livers and kidneys and gizzards and hearts, purvey a certain dark power that transcends even their nutritional punch. Maybe it's because we know that the creatures from which these things were cut could never have survived without them. It's pure fantasy, because these animals were destined for slaughter anyway, but in principle you could amputate a chicken's wing or a steer's leg -- or even, if you were an especially skilled surgeon, a slab of pork belly -- then sew up the wound; the injuries would heal and the animals would live almost normal lives, especially if they were lucky enough to be fitted with prosthetics. But an animal that gives its liver, heart or brain is irrevocably dead. Eating these parts, we feast on their ultimate sacrifice. How sacred is that? Last night's duck livers formed the second course in a meal that paired chocolate-themed dishes with select wines from Lodi, an historic swatch of San Joaquin County that after quietly producing vast numbers of grapes for over a century is emerging as California's lesser-known other Wine Country, sporting 750 growers and eighty wineries, some of which are family operations four and five generations deep. The annual Lodi Wine & Chocolate Weekend, set this year for February 9 and 10, attracts over 5,000 attendees. 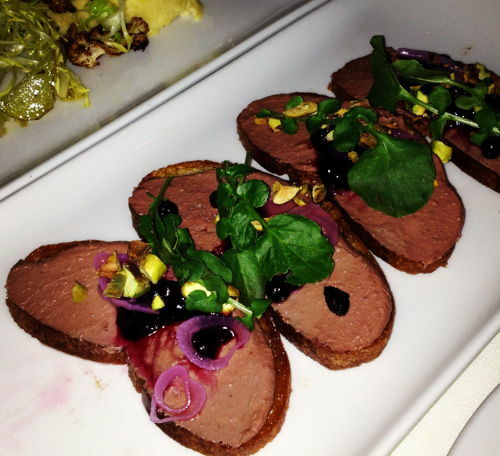 Our duck livers were paired with Bokisch Vineyards Graciano. The same wine went into the sauce for the dish. So deeply purple as to be almost black, it created a glorious echo chamber of layered dark, soft, fruity-spicy-chocolatey richness sip after bite and sip after bite. "Liver has a really neat consistency," sous-chef Ben Robert told me while prepping a panoply of raw duck livers before the feast, whose courses (including, among other things, cheese-and-chocolate ravioli paired with Borra Vineyards Heritage Blend) he crafted with chef Joshua Oakley of Tango & Stache. "Liver is also very versatile," added Oakley, who stands to the right of Robert in the photo above. "You can serve them whole and in terrines and in lots of other ways." Last night at the Lodi wine dinner, Ben Robert explained to me how he and Oakley take a sustainable "whole animal" approach to their craft. "We'll be standing there looking at, say, a whole rabbit. And we'll have all these organs that we need to figure out what to do with." "As chefs, we love livers because of the price point," Oakley added. "Plus you can manipulate livers pretty easily in terms of their flavor profile." True -- at least, as regards the livers of little creatures. Beef liver, that beautiful catcher's mitt of bovine butchery, has a personality too assertive to hide. And really -- why should we try? Let your liver flag fly. Start by soaking livers in 1/4 c of the cream for 4 hours, preferably overnight. The next morning, drain the livers well and rinse in water. Pat dry onto paper towels. In a large, hot sauté pan start with 1/3 of the butter and sauté livers with kosher salt and pink salt. Cook until just firm, then remove the livers and add vegetables. Turn the heat down to a low simmer and cook until soft. Once softened, add the Port and reduce until alcohol is removed. Add remaining cream and reduce by half. Pour all contents into a blender with the livers. While the blender is running, slowly add knobs of the remaining cold butter to emulsify. 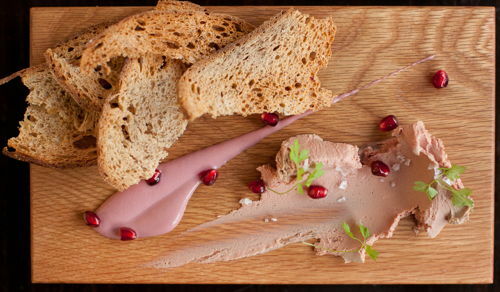 Images of Ben Robert and Josh Oakley and of duck-liver dish photographed by Anneli Rufus. Poggio Trattoria image courtesy of Poggio Trattoria. Hog & Rocks image courtesy of Molly DeCourdreaux. All images used with permission.